Cowhorse Equipment had several requests to design and produce this device strong enough to withstand what is asked of it. This is only a training devise to be used in certain situations. 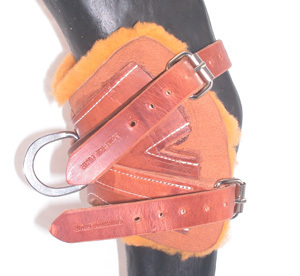 Made of Hermann Oak harness leather and sheep wool skin. The center ring is 1 1/2” flat stainless steel D ring. There are fleece sleeves to go over the leg straps.